When humanity is at war against vampire and deviants, mankind’s last line of defense is a group of young children known as “Gun Bullet Children.” They were trained by the Catholic Church to wield powerful magic that can rival the demonic hordes at the cost of most of their life span. One day, more than 500 vampires and hordes of deviants has been detected in the airspace above Tokyo Portal 5. The first line of defenses has been obliterated and the Gun Bullet Children launch a counter attack to stop the invasion. eXceed – Gun Bullet Children is the very first game of the series, made by doujin circle FLAT which was released at Comiket 69, on December 30, 2005. FLAT eventually shut down and transferred all copyrights to Tennen Sozai. Later, in November 2011 the eXceed trilogy was localized by Nyu Media in a single bundle (or individually) The eXceed Collection. Similar to Touhou series, eXceed is PC exclusive and focused on standard bullet hell but with some criticical differences which distinguish one iteration from another. While the second and third game has been translated, Gun Bullet Children is still in Japanese. So the text will not be displayed correctly unless the OS language is set to “Japanese.” The reason behind this is due to the loss of the source code, so the first game basically as a bonus. On the other hand Capcom wanted to make Gun Bullet Children as a standalone product and available for people who might want to purchase it separately. As an intro to the series, Gun Bullet Children is a simple game and may be worth a try. The main objective is to get to the boss at the last level and defeat them. In a game like this the biggest challenge is not dying en route. 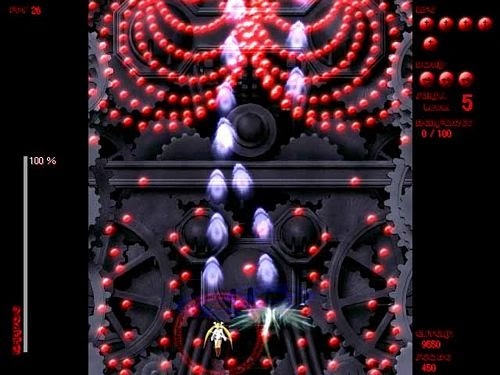 While the enemies and bullets are fast enough, they have a tendency to shoot in patterns and getting the rhythm down is an essential part of beating the game. Another important part of the game is leveling up your character which will make their standard attack more powerful. Destroyed enemies will make them drop red or blue items. Collecting this items are required not only for leveling up but scores as well. Whenever the score reaches a certain point, you get an extra life. There are three playable characters, each with different abilities, counter-magic and a nice bomb animation. With each character comes a new way to play, mastering all three will require a lot of practice. Chinatsu is the best character for beginner. Her standard attack covers a broad area which is great because player can indirectly shoot at enemies while dodging their attack. Each time she levels up, more bullets she can shoot at once. Making her attack cover a larger areas and cause greater damage. MIYABI HOUSEN - An orphanage who was raised by Catholic Church and inducted into the Gun Bullet Children program. No one knows about her past. A girl with fire abilities. Enemies that enter the range of her ability ‘Incinerating Kiss’ are instantly reduced to ashes. Miyabi is the most difficult character to play with. Her basic attack is just a single column of fire above her. Her counter-magic doesn’t cover the entire screen and only short range attacks which make it less than ideal for boss battle. SOWEL DEVOSIANA - A volunteer who joined Gun Bullet Children to seek the revenge against the vampires who killed her parents. Together with Chinatsu and Miyabi, she defend the holy land from vampire army after the first line of defense has beed breached. She use the power of ‘Byte Kingdom’ which can summon a Killing Doll that automatically target and attack enemies. Sowell shoots fire directly in front of her which make it less convenient for dodging attacks, but her doll shoots the enemy closest to her and doesn’t cause the player or herself damage if she’s in the line of fire. Her counter-magic makes the doll shoot fire in 8 directions that destroy all the enemies it touches. While there are few bugs in frame rate, Gun Bullet Children still a good game and following games get better and better. Purchase it separately is not recommended, and the best option is getting the eXceed collection with three games.